This is my favorite kind of decorating, yall. You can soak every surface in glitter, play around with different combinations and textures, and the end result is not permanent. I hauled out my old coffee filter wreath from last winter to hang on the mantle. It looked a little rough after a year in storage, but a little fluffing and squinting and I was okay with it. I even sprayed it with spray glitter but you literally cannot tell at all. (That’s okay. I know there’s glitter there.) I stuck turquoise flower on it and hung it from some glittery green ribbon over a mirror. Every year I think I’m going to change over my Christmas decorations to traditional red and green, but when it gets down to it? I just can’t resist some shiny silver and icy blue. I plopped some glittery branches in a simple white vase and added a little snowflake ornament to the front. The “peace” decoration came from Kohl’s after-Christmas sale last year, and I completely forgot I had it until I pulled out my decorations this year. On the opposite side, I filled my little pedestal bowl with shiny silver, blue and green ornaments, and filled a tall apothecary jar with pinecones. I already told you how I can’t get enough fresh greenery, so behind it all I layered some fresh greens, plus a few white poinsettias and ornaments. Have you all hauled out your decorations yet? Anyone else have to totally trash your living room to decorate your mantle, or is that me? It’s clean now, but there will be glitter stuck in the rug until next Christmas, spreading Christmas cheer for months to come. I love it! I love mixing in unusual colors for Christmas! Your decorations are so beautiful and festive! I’m so glad I got to see them in person yesterday! Where did you find that awesome mirror? I do love the M and candlesticks from last year, but you can always use them some where else! And if you ever want to trade us for our red and green one year, we would not be opposed ;o) haha! LOVELY. I think I like your mantle this year better than last year!! I adore everything you’ve done!! L-O-V-E!! I’m loving this year’s mantle!! Very festive. I like things that are Christmas-y but not throwing up Christmas. Make sense? What a gorgeous color combination- I decided to do black and white and silver this year. I love it!! I love seeing Christmas decorating in colors other than the traditional (red, green, gold) like I do. I am trying to incorporate more gold and silver but I do not buy anything new unless something has broken or is a real bargain. I work with what I have collected over the years as I have done with this year’s mantle. I love the coffee filter wreath..do not have time to make a wreath this yr. Great looking mantle! I am loving your color scheme! I must try a coffee filter wreath one of these days! Beautiful! i can’t resist silver either and i mixed it with turquoise and lime. i love both of your mantelscapes. It looks great!! I do agree that the blue is such a nice addition to the Christmas scene. I’m so behind on my decorating and it has been punctuated loud and clear today while I”m catching up on blog reading. I love the color scheme! What an awesome alternative to red/green. I laughed out loud at your comment about finding things you bought last year at after-Christmas sales! That’s one of my favorite things about decorating as well! I LOVE your mantle! I almost made a coffee filter wreath for mine but decided against it due to my lack of patience. I love your “M” from last year too! 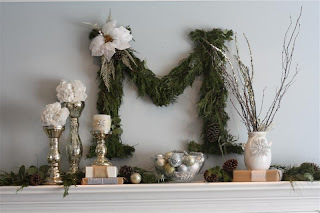 I love the mantle, but have to ask – how did you make the coffee filter wreath? I really loved the Ikea frame hanging tip you gave, that’s what started me following your blog. I love the way you’ve done your mantle, especially the colors you’ve used!! I’d love for you to link up to my first ever Holiday party! I always forget what I purchased at clearance the year before and I get all giddy when I open my bins! Love your coffee filter wreath. I so need to make myself one! Love your mantle, very crisp and clean. Love the M from last year. Hope you have that somewhere! Hope you can stop over and check out my Holiday mantle! Just stopping by from Hooked on Houses and I love what you’ve done with your mantel. Do wreathes COME any more lavish than that??? And seriously? Coffee filters? I am SO going to have to try this! Happy Christmas! I had to laugh at your comment about after-Christmas purchases…. it’s like a treasure hunt at my house! Your mantel is soooo pretty and I like this year’s better. I LOVE the mirror and wreath together. I got married in February of this year. So, someone had a Christmas shower for me last year about this time. This year, when I got out all of my decorations, it was like I was getting presents all over it again! It was sooo fun decorating our new home together. Agreed…I love finding all of those treasures I picked up after Christmas. What an elegant and classy looking matle Kelly… just gorgeous. The mantle is beautiful. I love the turquoise! Your mantles (this year and last) are beautiful. I love how you layered the greens. And did we all make coffee filter wreaths last year? Ha. I have two. I really like how you spiced yours up with the turquoise flower and ribbon though. Great idea for next year. This year’s AND last year’s mantles are BOTH WONDERFUL!!! I love the various textures/heights/all the contrast!!! Found you on Michaela’s Blog. Your mantle is beautiful! I love the color combination. Your wreath is fantastic too! kelly, that is gorgeous! i like last year’s, too! both are fab! going to follow you- love your style! Gorgeous. What a great color combo for the holidays. Merry Christmas to you! I love your mantel this year – its beautiful!. I personally love this colour scheme. It is what I always wanted, and last year I finally got it. (ie I finally let go of hand me down christmas decorations that were ruining my scheme – very hard to do, but the ones that meant the most I kept for sentimental reasons – some even found their way onto the tree this year..lol). I have added touches of gold as well to mine and found it warmed the sceme up just a touch and it feels a little more christmassy. Absolutely brilliant. I definetely had exactly the materials where I bought before I found your idea. I had a different idea earlier, to decorate my front etalage window. Since, it’s too crowded next to my Christmas tree I think over some other idea. Found your idea, I love this idea so much and turned it into something amazing. Thank you for sharing-Happy holiday! This is so beautiful! I enjoy the deviation from traditional red & green as well. The coffee filter wreath is wonderful! (Do you have a tutorial on it by the way?) I would love to make one! Thanks so much! I found the coffee filter wreath tutorial here: http://www.thenester.com/2010/11/making-a-coffee-filter-wreath-and-tree-and-things-of-that-nature.html. Merry Christmas!